Moreau Emergency Squad, Inc. is a public squad whose members are on a volunteer status and proudly protect an area of approximately 60 square miles. Operating out of one station that protects a primarily residential area. 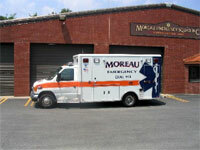 As a New York State Certified Volunteer Emergency Squad, the Moreau Emergency Squad provides EMS coverage to the Village of South Glens Falls, Town of Moreau, and the Town of Northumberland. The Moreau Emergency Squad works in conjunction with the South Glens Falls Volunteer Fire Company, the South Glens Falls Police Department, the Gansevoort Fire Department, the Saratoga County Sheriff’s Department, the New York State Police, and many other agencies in the area.